Like most Americans, the economic climate is inspiring me pinch pennies and even (gasp!) put away some money. While more responsible parties may have been doing this for years, this is all very new to me. And though I was never good at keeping track of what I spent, when I was forced to take a step back and look at where the majority of my money was going, it was safe to say: food. As of just a few months ago, I would mindlessly and happily throw expensive granola, perfectly aged cheese and ten different kinds of greens into my grocery cart without thinking twice about how much any of it cost. And those groceries would sit in my kitchen while I went out and spent $40, $50 or even $60 on dinner with friends. In many cases, I was literally throwing away money. So when a friend in Brooklyn mentioned he was going to start limiting his food expenditures to $50 a week and planned to write a blog about it, I immediately jumped on board. I, along with the other two bloggers, have had a hard time giving up certain things—fancy cheese, skim lattes from the independent coffee shop down the street, granola and spices that don’t sport generic labels—but since we started the project June 1, I imagine I’ve cut by monthly food budget by at least $250. And even though we go over budget sometimes (and, admittedly, cheat every once in a while) more often than not I’m forced to find creative ways (beyond spending frivolously) to satisfy my cravings. 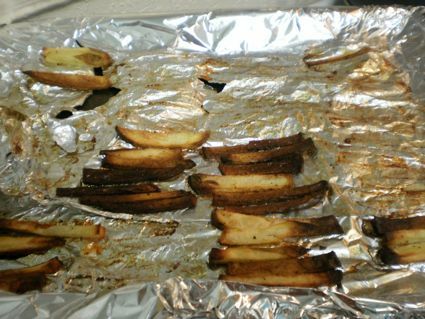 Exhibit A: French fries. 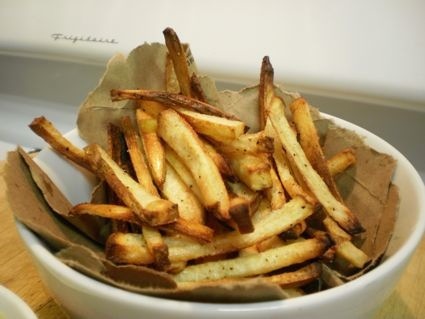 Though I could benefit from watching my waistline as much as I’m watching my wallet these days, I just cannot resist the savory, crispy goodness of French fries. And while I guess I could have ordered some off of the McDonald’s Dollar Menu to stay under budget and still have fries, it sort-of goes against everything the project is about, which is to eat well while staying within a reasonable weekly budget. So instead of getting a six-dollar order of fries at a restaurant or burger joint, and blowing more than 10% of my budget (not even including tip), I decided I would try something I’d never done before and make my own. If you don’t count what I already had in my kitchen, they cost me a whopping $0.98. Still somewhat in the habit of over shopping, I bought two large baking potatoes for my fries. It turns out I only needed one. 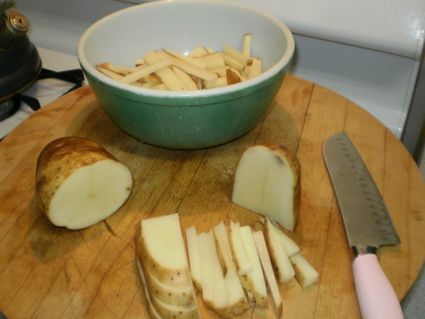 Scrub potato (peel the skin if you want, but I love the skins) and cut it into long (about half the length of the potatoes) strips about 1/4-inch wide. 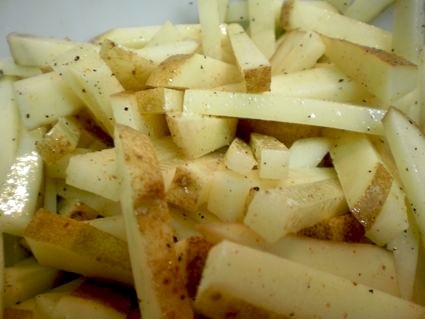 In a large mixing bowl, toss the potatoes with the olive oil, salt, pepper and cayenne pepper. Because these fries are a little bit spicy, I wanted something sweet for dipping. If the title of this dipping sauce doesn’t give it away, mix about 2 tablespoons of mayonnaise with 1 teaspoon each of honey and mustard. 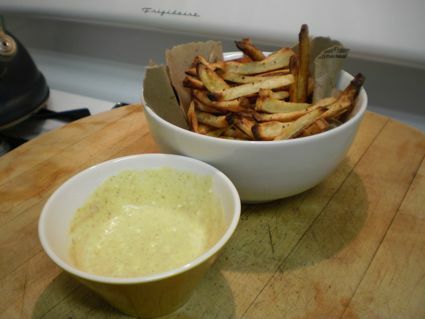 The sweetness of the sauce will compliment the salty, spicy fries. Verdict: Delicious! 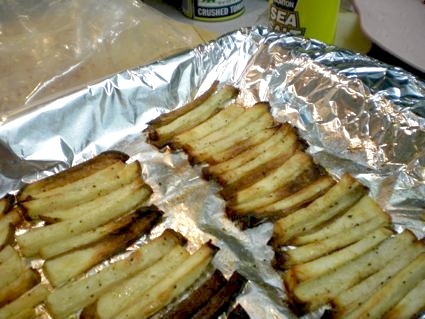 The next time I have a craving for fries, even if I have room in my budget for them, I’ll most likely make these instead.